Bruttium, Terina. ca 300 BC. AR Third-Nomos. Bruttium, Terina. ca 300 BC. AR Third-Nomos. 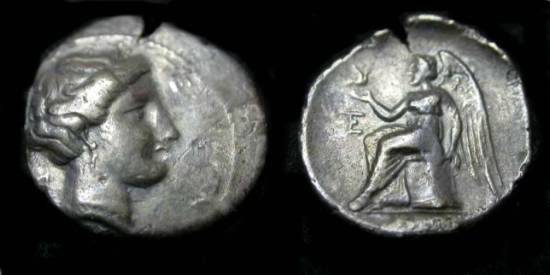 TERINAIWN, head of nymph right, in triple-pendant earring & necklace; triskeles behind / Nike seated left on cippus, holding a bird in her right hand; TE monogram to left (2.19gm) BMC 1-393,44; SG 510v.